Then the Centre of Excellence in Movement, Dance and Dementia can help you. What is the Centre of Excellence in Movement, Dance and Dementia? The Centre of Excellence aims to equip health professionals working in dementia care with the knowledge and skills necessary to explore the use of movement and dance. Help staff to work closely with people living with dementia and their carers implementing the skills and knowledge. As the proportion of older people in the population increases so does the number of people living with dementia and their carers. As the condition progresses, an individual’s ability to communicate deteriorates increasing stress and putting pressure on all those surrounding the person. There is increasingly important evidence that arts and movement based interventions help maintain wellbeing and self-esteem, improve mood, support relationships and enable communications. The Centre of Excellence is part of a new movement growing nationally and internationally concerning the development of arts-based non-pharmacological approaches to supporting people living with dementia and their carers. With a value-base securely rooted in ‘Person-Centred-Care’, it places movement, dance and embodied practices at the heart of this approach. The way that a person feels is communicated through their body movement their posture and gesture. Becoming more alert to and knowledgeable about the meaning and importance of this non-verbal communication, often with people who have lost verbal communication, opens up new ways to relate and communicate. For example, if a person struggles with word finding, with knowing where or who they are, it can be of great relief to know that there is someone close who can accurately read, interpret and act on that non-verbal communication. In dementia care generally, this is currently an under-developed area of knowledge, skills and practice. Enhanced self-awareness which promotes language retention and memory recall including re-experiencing specific memories. Richard Coaten PhD is a dance movement psychotherapist within our trust working part-time on Beechdale ward; an older adult psychiatric ward at Calderdale Royal Hospital, Halifax. An experienced arts psychotherapist, dancer, arts/health worker and trainer, he is a leading UK specialist in movement and dance-based work with older people with memory problems and their carers. He has a doctoral thesis on ‘Dance movement psychotherapy and dementia’ from Roehampton University and recognises the need to develop the training of dancers, dance therapists, care staff and others in the field of embodiment, embodied practices and non-verbal communication. He has published work to his credit in the form of papers, articles and chapters in books. In 2010, as a Churchill fellow, he spent a month in Toronto, Vancouver and the Rockies, communicating his research and work with leading specialists and researchers in the field. 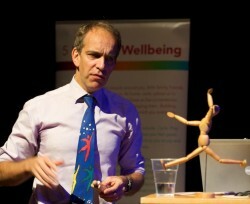 Richard has spoken at many conferences over the years, including ‘Memory- the first national conference on dance and dementia’ in Liverpool in 2010 and the international centre for research in arts therapies in Cambridge in 2015, ‘Arts therapies and dementia in the twenty-first century’. He has taught many workshops and contributed to dance movement therapy (DMP) training in Ukraine and Romania up to 2017. He supports the work of Creative dementia arts network (CDAN) and is the association for dance movement psychotherapy UK delegate to the European association of dance movement therapy (EADMT). He is one of six DMP professionals in Europe featured on a new film that was filmed at the first EADMT conference in Riga, 2014 and released in September 2017 about how DMT helps build resilience in people. Richard is a member of our governance group for Creative Minds and is on its local Calderdale collective governing group.